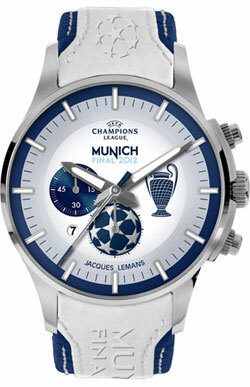 New Jacques Lemans watches in honor of the Champions League final in 2012 in Munich. 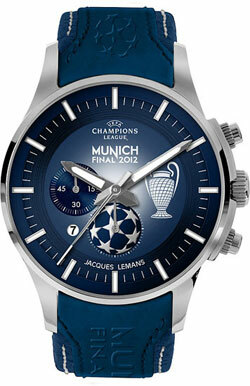 New Watches Jacques Lemans in honor of the Champions League final in 2012 in Munich. Avstiryskaya Jacques Lemans watch company announced a limited edition watch in honor of the Champions League final to be held in Munich, May 19, 2012. The new line includes chronographs, decorated with symbols of the original Champions League on the dial, strap and crown depicts a famous star ball. The dial is also decorated with the image of the Champions League and Cup commemorative inscription MUNICH FINAL 2012. New items are made in white and blue. Chronographs are modified a little second hand, made at the side of the dial-minute drive and the date display. The round building new products, made from high-alloy steel 316L, has a diameter of 44 mm. The front side of the body is equipped with a proprietary impact-resistant glass Crystex, which combines all the advantages of sapphire and mineral glass. The case is waterproof to 100 meters. New products are designed on the basis of the highest quality quartz mechanism. Available models of genuine leather straps. As the representatives of Jacques Lemans, new hours will be a perfect memorable gift for fans and fans of the beloved game.